No pressure or anything, but this will come very useful in about two weeks when I get back from vacation to finish the rest of the VO acting on my game. I think it will be sooner than that, but worst case drop me a note and I'll find a solution. Re: EDITOR PLUGIN: Speech Center - Version 2.0.0 - with text editing! It took a lot of effort to test this and to provide the best experience possible. Please let me know if you encounter any trouble. I also took many precautions in the edit feature and tested it with any source I could find. I still recommend you backup your game before editing, especially when using the feature for the first time. As usual, please provide any feedback you'd like. Many of the features here are the direct result of the posts in this forum. Re: EDITOR PLUGIN: Speech Center - Version 2.0.1 - now with text editing! I uploaded a minor update with a few fixes. Download link remains the same. Feel free to comment or suggest additional improvements. Version 2.0.2 released. Includes a bug fix that prevented exporting VA scripts in some cases. Hello! I have copied the DLL into my AGS root folder but every time I load AGS I get this error pop up and I can't use Speech Center. Any idea what may be causing this please? Could it be that the game files were saved with an AGS that had no speech center installed? Mind you, I think one of the games I'm trying to load definitely did have Speech Center installed and was used before I got given the game files, yet the error still pops up. Perhaps I'm missing some essential system file? The error message indicates that it failed to load the "System.Core.dll" which is part of the .NET Framework 3.5+. Do you have .NET 3.5 or higher installed? The AGS editor itself requires .NET 2.0, but it looks like the plugin requires a higher version of the framework. Ok, so next question... You have a complete game, with no voice acting attached yet. There are many, many lines spread over different rooms, dialogs and global script etc. None of them have line numbers, &1, &2. I was under the impression Speech Center would be able to work through and number them all for me, but I guess this isn't the case? Will I still have to go through every line of script and number them, &1, &2 etc? Is there a quick method of doing this? I was thinking maybe in the "number" box you could just add a number but it seems you have to double click to enter the script etc. If this is the case, I guess sorting by character and working through it that way would be quickest? If anyone has any decent methods for working on it from a game that has no VA currently, it'd be a lot of help Sorry, I'm new to this, and need to find the quickest and simplest method. The plugin does support automatic numbering of the game, you have to switch to edit mode and then in the edit dropdown you have an option to number all non-numbered lines. After that once you save the project it would apply the changes to your scripts/dialogs. The way it works is that it only numbers the lines currently displayed and not the ones you may have filtered out. It also only touches lines that don't have a number. The number is the lower available for the character. It also detects if a character has two different lines with the same text and if so it reuses the same number. I had to add a specific edit mode due to the fact that the plugin interface doesn't have a way of notifying other components that an edit is in progress and no way of knowing if a script/dialog has pending changes. For this reason there's a dialog when entering edit mode and also upon save it closes all other windows and exits edit mode. However, you have full control over this behavior in the preferences because I didn't want these features to become nagging or annoying. For the .net part, yes you guys are correct, I compiled it with 3.5 which is the highest .net version I can use while the editor is compiled with 2.0. Sticking to 2.0 for the plugin would have made some parts of the code overly complicated. My hope is that the editor would move to at least 4.0 at some point and then I'll make the same transition. Currently aside from automatic numbering there's inline editing of the text itself. I didn't add an option to manually edit the number from the plugin. It's not impossible, but there are some details to take care of so it may take time to add it. Anyway, let me know if that feature has real use. Please update if you managed to use the auto-number feature or whether something else needs to be worked out. The game's default language is Italian. It has an English translation. Being English, it's only viable for me to work with the English texts and voice scripts. I can only auto number the lines to the default language (Italian). Although it also numbers the lines of the English translation, it no longer displays any English, whether I select to view default or English translation, and so exporting the voice scripts always occurs in Italian. From that point, attempting to switch to English nothing happens, it just remains all in Italian, as if it's overwritten the English or something. I don't want to set the translation (English) as the game default because that will overwrite and destroy the Italian text. If there is no way around it, I guess that's the only option, turn it into an English only game. Ah, I just thought of a workaround. Have two copies of the game. When complete, copy all the voice files into Copy 2 speech folder. Then run speech center to number all the lines in Italian, and in theory, it will then work okay. Does that seem like a fair assumption? There could be some errors that way though.. I believe the source of the problem is that once you have a game with translation, the code doesn't update the existing translation key with the new string (the &number is considered part of the key when translating). So if you go to the translation you see Italian because the key for each line changed and there's no English translation for the new one. The workaround you suggest will most likely work since the same lines will appear and will have the same order for both languages. However, I believe it will not work if you would like the compiled game to use the compiled translation file with this method. I'll try to see if there's a quick fix for this. Thank you. I'm sure in time other commercial developers who deal with multiple languages may to need it to work like this too. Let me know if you come up with something. I don't really want to use the workaround, but deadlines...so will probably have to for now Other than that it certainly is a nifty thing! I just noticed a bug (is it?) when using 2.0.2 with AGS 3.3.0 Beta.. It's more than just this edit. The bug is in the AGS editor beta code. AGS.Types.Scripts doesn't return the correct count. If I have 10 scripts (5 header and 5 code) it returns 5 as the count (multiplying by 2 is not a good solution since some scripts may not have both file types). This problem was introduced on July 24 or July 27 in the AGS Git code repository. I changed my code to work around it and not rely on count, but this should be fixed in AGS. Version 2.0.3 is now released here. This version fixes the automatic numbering with translation problem and a workaround for the script count problem in AGS 3.3.0 beta. AGS.Types.Scripts doesn't return the correct count. If I have 10 scripts (5 header and 5 code) it returns 5 as the count (multiplying by 2 is not a good solution since some scripts may not have both file types). Out of curiosity, how? Doesn't the editor always create and remove headers and script files together? Dialog and room scripts do not have headers. Also, there is at least one header created internally (where all the system symbols are defined). PS. To clarify: this "Scripts" class is used not only to keep user scripts, it may be used for some internal purposes too. Ooh. Is that a fix on the issue I was having with it or someone elses? Are you sure about that? Because I'm terribly worried you're just making this all up as you go. AGS.Editor.AGSEditor.GetInternalScriptM odules: These are never added to CurrentGame.Scripts. Nor are any of the Dialog.Script objects. Nor are the UnloadedRoom.Script objects. The Scripts class is used for collections of scripts, but the exposed Scripts object never contains anything except the scripts shown in the ScriptsComponent. To clarify. Find Game.ScriptsToCompile. It is of "AGS.Types.Scripts" type. Well, maybe except room scripts, frankly I could be mistaken in regards to them. E: right, I am wrong, because rooms are compiled separately from anything else. I wasn't contending that the Scripts type is never used for non-public scripts. I was asserting that the CurrentGame.Scripts object (which is of the Scripts type) is never populated with non-public data, or anything other than what shows up under the "Scripts" pane in the editor. Edit: As to modifying the Scripts type to operate as a collection of ScriptAndHeader objects, there's absolutely no reason that ScriptAndHeader.Header couldn't be null. The relevant functions should then be updated to handle such a case. Currently the Scripts collection is actually quite messy in that you can't "Add" a header without an associated script, but you can add a script with no header. Then Scripts.Count returns the number of ScriptAndHeader objects, but the indexer accesses items based on the underlying Script objects. This is bad design. Fair enough. But Snarky's question really seemed to be referring to the Scripts component rather than internal scripts... but anyway. P.S. I edited my last post a couple times, just in case you missed any of it. Edit: I pushed a fix for the reported issue, by updating the interface of the Scripts collection. It now operates directly on ScriptAndHeader objects exclusively. For scripts without an associated header, the Header property returns null. This may break some of the functionality you were using, because I've removed/replaced some of the exposed functions. I just looked at the class and it would certainly break any plugin that runs on the beta but compiled with the release version, including mine. So I don't think it's a good fix because everything in AGS.Types is exposed to the plugin. How am I supposed to support those who decide to use the beta? And if I change it, then those would use AGS 3.2.1 will not be able to use the plugin. I also believe you can still have a backwards compatible enumerators and items accessor for the Scripts class even if the internal implementation changed to ScriptAndHeader. Then at least you don't break those that access the class. It's not extremely complex, but it will require some attention to some details. So please don't leave this change as-is, it's going to be hell to maintain plugins if the interface breaks like that. Great! This time it worked, it's showing me it in English (the translation) and allowing me to export it like that. No need to use the workaround now it seems. Thanks a lot!! Hello again SpeechCenter I think I've run into an issue, or I'm doing something incorrectly. The games default language is Italian and it has an English.trs (translation). Auto numbering works fine and it displays both the default language and the English translation all numbered fine, scripts generated okay. Now I compile the game and play it, and it's always showing Italian. Even with winsetup set to English.trs. Though it only appears to be dialog that's affected, as GUI elements are still translated, and the trs file is intact (with the English translation). So I'm puzzled why this is happening. Any ideas? AFAIK, AGS uses the full text with the &number as the key in order to determine the translation. If the original file does not contain the number in the original (Italian) line then it won't find the correct English line. So what needs to be done is to update the translation file (from AGS, not the plugin). I make sure to copy the translation with the new number into the translation data structure so when you update the translation it should be in there with the correct values. After that it should work. You will actually see after updating that the translation file that it contains two sets, the original ones and the numbered ones (probably the original in the beginning and the numbered in the second half). This is an AGS behavior, it would be the same if you were to go to the script manually and change the line numbers on your own. It's not something major, it just means your translation file is bigger and has irrelevant lines. I think the right place to add cleanup is in the translation component since it's the one generating the file. It's probably possible to think of a script that removes the unnecessary lines in your specific case. Still, it should work after you update the translation file, so it's best to start by verifying that. Thanks for the quick reply. I understand what you mean and have tried it. Edit. I've totally confused myself over this. If you can give me a step by step guide it would be useful, and now speech center won't display any of the English translation so I've either overwritten something...like I say, totally confused!! Thinking about it a bit, if you have done all steps till 6 and closed the project then it's possible that when opening it again this new translation information was not saved because the file was not updated. Will have to check that. If there's another reason it doesn't display the translation anymore need to understand what was done, it worked in my tests. Thank you for explaining Everything worked out this time and all is in working order. Hi again SpeechCenter. The script generation is very useful, however I've found that the index.html that gets created shows the number of ALL lines, including repeated ones. I'm wondering if there's any possibility of it being made to display actual number of lines (that need recording) and perhaps then total number of lines after that? For example, 4 lines that all say "I don't need to do that." and get recorded once (ie all using EGO3.wav), get listed as 4 lines. Although this doesn't happen much with NPC's it's certainly a key factor in player lines, who often repeat what they say. The feature itself (of showing number of lines in the index.html) is very useful, I just don't think it's showing the most useful information. Does that make sense? Currently the actual file per character does display the duplicate lines differently, but the index is just the total of all the lines. It shouldn't be difficult to add to the index that since the information is already generated. As a workaround you can filter duplicate lines in the plugin and export only the displayed line. It should generate the index file with the correct number of lines. If you want to have the full scripts with the index file just copy the file to the same directory as the other scripts. The two options should generate the VO scripts in different folders so you don't need to rename things between the two actions. Please see if the workaround gives you what you need. Thanks, so do not show duplicate lines via plugin and then export only displayed, created "Voice_Scripts_Partial" and THAT seems to be showing the actual number of lines that need recording in index.html. Thanks! If you are using the AGS 3.3.0 beta and the plugin, please make sure to use beta 12 (build 3.3.0.1152) or above. This release should fix any compatibility issues associated with editor plugins that existed in some earlier beta versions. If you do find any problems with the plugin while testing the beta release then let me know. If you are using the current release version (AGS 3.2.1), no action is required at this time. Version 2.0.4 is out and available here. Fixes a parsing error in some specific scenarios. Can I just say that this is bloody amazing. Not sure where I would go from here without this plugin. So I have been using this plugin for four years now and had no problems. I would seriously be lost without it. Today, sadly, I have hit a snag. The plugin can pick up dialog that is called by global functions, but that doesn't seem to apply to functions that are subcommands of other objects (like structs). Is there a way to enable Speech Center to pick up these conversations? Or should I cut my losses and just redo how the function works? In hindsight, I probably should have tested this out long before now. Cool, glad you liked it and found it useful. I checked and indeed this option is not covered. I'll try to find some time to update this, but I cannot really say at the moment when I'll be able to do that. Is it possible for you to use a global function for now? Well, it will be a looong time before this game is ready for voice acting. At least a year. So if you think it will be addressed sometime before then I will keep going as is. Thank you! Good evening to all AGSer. This is much interesting to know. I didn't knew (since a couple of minute ago) that the file.tra doesn't translate any String inside an array. In other hand, I should revisit all of my scripts and to do something like this. I wish I could ask you for confirmation on this issue before changing further the source code. Choose the way which is more convenient for your case. Thank you CW for the quickly answer. I must need to try this further now, then I will be right back here again and let you know. Okay CW, it's all working like a charm !!! I really much appreciate for your help, really. Now the file.tra can translate String inside an array as well. Both of the way I run the game (English or not) the String get read just properly fine. Anyhow, I still have to revisit all of scipts in this way. But I don't care because I am really much HAPPY that I got it to work, finally. With this approach it will save me a lot of time for sure. Hello! So it's been a year and a half and I'm gearing up to start recording in a month or two. Any chance of this being addressed? Thanks again and apologies for the issue. As you can see, only SOME of the lines have the "Player:" line before the dialog, while others do not. I did some digging and discovered why. The player's lines that got exported to the script are the lines that are checkmarked as "show" in the editor. I would like ALL of the player's lines to be exported. Is there a way to do that? The player characters isn't voiced, which is why I didn't write include their lines in the dialog itself. Any help appreciated! Thanks again. This module is absolutely indispensable! Triple posting! Sorry to keep posting in this thread, but I discovered a bug and a workaround that folks might be interested in hearing. So I noticed that one specific room script wasn't being picked up by the module. I was tearing my hair out trying to figure out why. I noticed that when I commented out the majority of the lines in the script, it got picked up. Naturally the room in question was one with LOTS of lines, so after about an hour of commenting and uncommenting later, I discovered the cause! I mistakenly added an extra "); at the end of the command. This is something that the compiler ignored, but the Speech Center plugin did not. I removed the offending code and it now works perfectly! Edit: I've tried contacting Gilad by PM and email, and have had no reply. So I guess it's safe to say he is no longer actively working on the plugin? Does the source for this exist anywhere? I found another bug in the plugin. Sorry to keep multi-posting. The developer of this plug-in doesn't seem to be working on it anymore, so i figured I'd post it here so others are aware. If Speech Center is in edit mode and you compile the game, AGS freezes. So be sure to SAVE the game (to get out of edit mode) before compiling. Huge apologies for the long time being away... too many things happened in real life and only now I have seen all the messages so I wasn't aware this was going on. These issues certainly need to be addressed as well as the requests which are overdue, the goal of the plugin is to improve the productivity and I'd like to ensure this is maintained. I'm going to see what I can do, will take me a bit to figure all this out. If I see I don't have the capacity to handle then I'll look for other options to address. Again, sorry for the delay in my response. Woohoo! Great to have you back. Whatever you decide you can do about these feature requests, I really do urge you to open-source the code. It's so vital to a lot of game projects that a risk of it not working or nobody being able to maintain it in the future could mean AGS isn't a viable option any more, just because of that. It's your choice, of course. But even if nobody actually does edit the code, just knowing that in the worst case, as a fallback option, someone else could make some desperately needed fix or addition would be a huge relief. It doesn't have to be a big effort: Just picking a license and dropping the source code on Github or Bitbucket (or just zipping it up and sharing a link) is pretty quick. He returns! Good to have you back. I've been playing around with Speech Centre and it's such a time saver! However, I've run into a snag. We use custom hotspot properties for base responses that don't need specific code, whenever the character responds with just a line of dialogue. 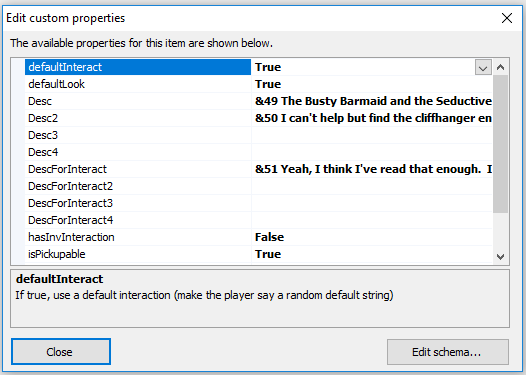 If defaultInteract or defaultLook is set to True, it uses the lines provided below. Looks like Speech Centre doesn't pickup on these lines (those speech file numbers were added manually), I guess this isn't how most people handle default responses but it seemed like a nice tidy way of doing it when we started. It's a very interesting way to implement, I'll have to look at whether there is an easy way to access the hotspot properties. It does sound like a very specific way to implement this (interesting to know if others are using this or something similar), so I'll likely try to first look at options that allow extracting data from other sources a bit more generically. Since I first want to ensure to get the plugin back to working condition, this use case will go to the backlog for now. Thanks for taking a look, honestly it might not be worth your trouble (unless there are other people working like this). I spent a couple of days going through and converting everything over to room script, so it all plays nice with SC now. It's good to hear you're revisiting the project, it's an amazing plug-in!